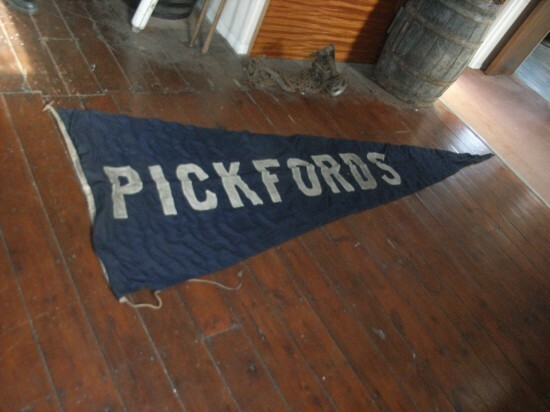 In 1862 Pickfords started a daily service from Portsmouth to “Ryde, Cowes and all parts of the Isle of Wight”. The boats to Ryde went in at high tide and then as the tide went out they stranded on the sand for high-wheeled horse drawn carts to unload the goods. At Cowes they used a wharf. At this time all the ships were sailing vessels but in 1906 Pickfords took delivery of the Motor Vessel (MV) “Wasp” which was claimed to be the first motor cargo vessel ever built. However, two Newport companies, Crouchers and Shepard Brothers were operating a freight service even earlier at the beginning of the 1800’s. They had a service from Southampton Town Quay to Newport. The first vessel to be called the “Bee” was bought by Shepards in 1849. By the 1920’s their fleet comprised 2 steamboats, 2 sailing ships and 3 motor vessels. By the 1930’s Croucher’s fleet consisted of 11 motor vessels and 3 barges. In 1936 Pickfords bought these two businesses to give them a combined fleet of 21 ships. After the building of Cowes breakwater which improved the protection of the wharf, most goods were unloaded at Cowes and distributed by road. Newport Quay was used mainly for bulk cargo such as timber, sugar, flour and animal feeds. In 1948 the freight service was nationalised under the Transport Act and eventually in 1956 became BRS Ltd. The men who manned these ships had to be tough. They were expected to keep the service going in all weathers. They often had to work long hours, sometimes doing two voyages a day, particularly in the summers when the Island’s population mushroomed with the influx of holiday makers and the demand for freight services peaked. The ships were not very comfortable and lacked the protection for the crew of modern vessels. The older ships were not fitted with wheelhouses until the second world war and the skipper only had the protection of a square of canvas. Many skippers had grown up in the service. They started as boys as fourth ship hand, (Captain Trowbridge started at the age of 12 in 1898), and progressed through ship hand and mate’s job until they became skipper. Despite the hardships a survey in 1953 showed that of the 51 seamen then employed , 14 had worked for between 35 and 47 years. Some of the ships served even longer than the crews. The original Bee was built in Cowes in 1801. She was a 41 ton sailing ketch. Her the registered owner before she went to Shepard Brothers in 1849 was Thomas Robinson. She continued working as a freighter until 1927 when she was deliberately run aground in the River Medina opposite the Folly. Such was the quality of build of this ship that despite her age, (she was built before the Battle of Trafalgar), her hulk can still be seen today and it is said that much of her timber is still in good condition. In 1950 the Norris Castle was brought into service on the Southampton to East Cowes route. She was an ex-tank landing craft which permitted, for the first time, cars to drive on and off the ferry. Previously, they had to be lifted on and off by crane. This marked the beginning of the end for the river freighter service. By the end of the sixties with the coming of the roll-on roll-off ferries the demand for the service declined and by 1971 only four ships remained.